For The First Time, Majority Of Americans See Cuba Favorably In Poll : The Two-Way Gallup says that for the first time since it started asking Americans about Cuba back in 1996, a majority now see the country in a favorable light. For the first time since Gallup started asking the question, 54 percent of Americans said they see Cuba favorably. 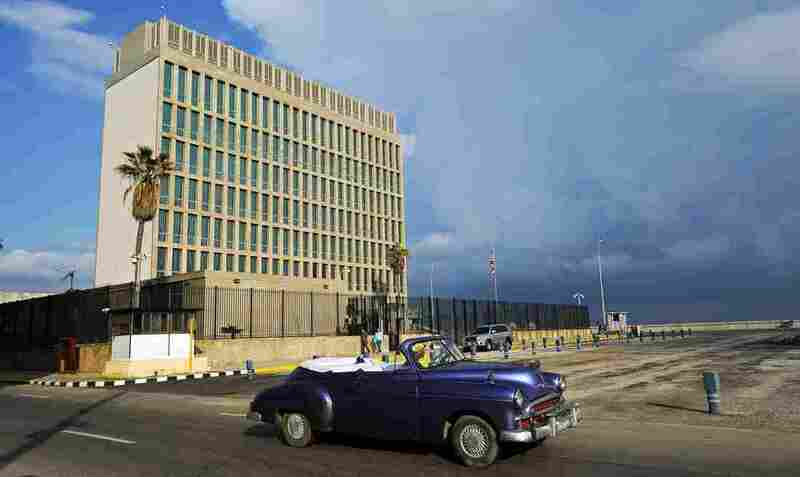 Here, an old American car passes by the U.S. Embassy in Havana on Dec. 17, when the United States announced a plan to resume regular flights to and from Cuba. Reflecting a move of 33 percentage points in the past 10 years, a majority of Americans — 54 percent — currently see Cuba in a favorable light, according to Gallup. The nation's favorability rating went up across the U.S. political spectrum, but by far the biggest gain was among Democrats. A "strong majority" of Republicans still view Cuba unfavorably, Gallup says, with only 34 percent seeing Cuba favorably compared to 73 percent of Democrats and 53 percent of independents. "During the past few years, Americans' opinions about Cuba have become sharply polarized by political party," Gallup's Jim Norman writes, "with the Democrat-Republican gap in favorability more than doubling in the last two years — from 17 points in 2014 to 39 points today." But because of the gains, Gallup says that for the first time since it started asking Americans about Cuba back in 1996, a majority now see the country in a favorable light. When Gallup first asked Americans about their view of Cuba back in 1996, only 10 percent said they saw the country favorably. Today, 54 percent say they view Cuba in a favorable light. The news comes as the relationship between Cuba and the U.S. continues to thaw. On Tuesday, American and Cuban officials "will sign a civil aviation agreement in Havana ... re-establishing air service between the two countries for the first time in decades," as Laura recently reported for the Two-Way. And on Sunday, Rodrigo Malmierca, Cuba's minister of Foreign Trade and Investment, arrived in Washington to discuss business opportunities and other issues with U.S. Commerce Secretary Penny Pritzker, Cuba's Granma news service reports. The poll is based on a survey of a random sample of 1,021 adults aged 18 and older in all 50 states, Gallup says. Taken from Feb. 3-7, the poll has a margin of error of 4 percentage points.